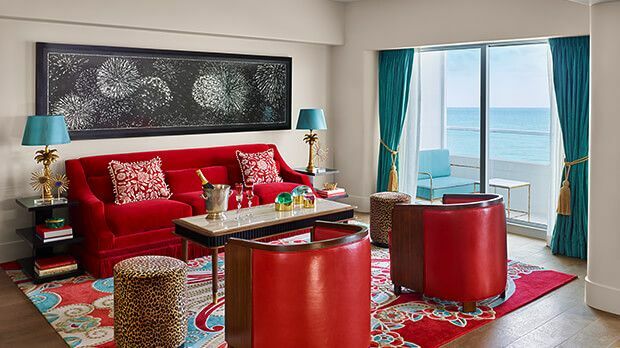 Situated in the Faena District on Miami Beach, Faena Hotel Miami Beach is within walking distance of numerous art and event spaces. The hotel is about 10 blocks north of South Beach. Miami International Airport is 30 minutes away. 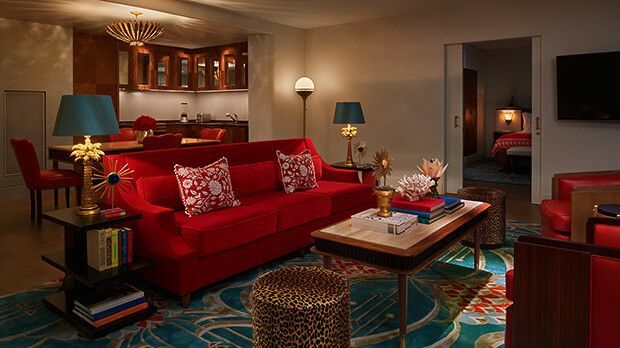 Step into a world that blurs the line between dreams and reality at Faena Hotel Miami Beach. This wonderland of color, sunshine and glamour effortlessly captures the imagination. From signature candy cane-striped umbrellas and luxurious private poolside cabanas, you’re bound to find your place in the sun at Faena Hotel. 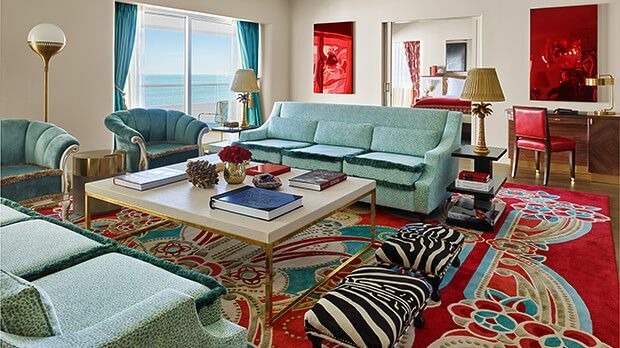 This Miami Beach luxury hotel is a place where sunshine restores, ocean air refreshes and service fulfills. With one-of-a-kind restaurants, nightly live music, concerts, cooking classes and more, there is never dull moment around here. 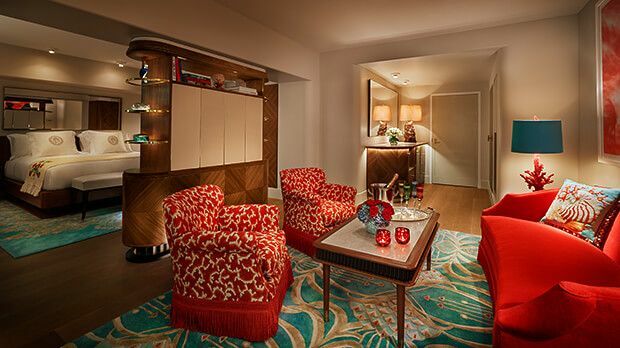 The 169 rooms and suites are a celebration of Art Deco design, featuring retro-inspired furnishings, custom woodwork and bespoke bed linens made in Italy. Spacious marble bathrooms are appointed with Tierra Santa bath amenities, while all of the suites come with freestanding tubs. The Tierra Santa Healing House, an impressive 22,000-square-foot sanctuary, is located on the third floor of the hotel. Guests can relax at one of the largest hammams on the East Coast, or experience shaman-developed body-healing rituals and technologically advanced facial treatments. Afterwards, discover the art of open-fire cooking at Los Fuegos by Francis Mallmann, tempt the palate with innovative Filipino-inspired dishes at Pao by Paul Qui, or dine in style under Miami's glimmering sun at the tropical Veranda restaurant. 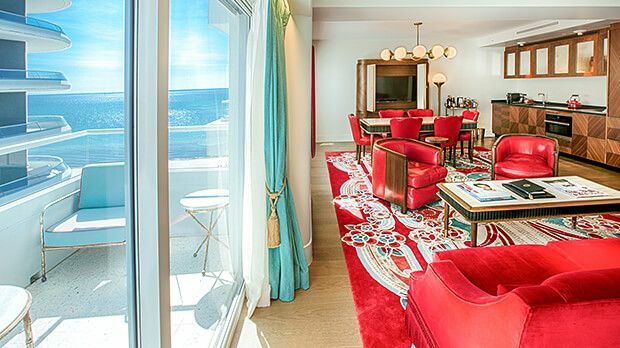 Send an availability request with your requested dates to the Faena Hotel Miami Beach. Features 2 Twin beds, balcony, sunset bay view, marble bathroom and walk-in shower. 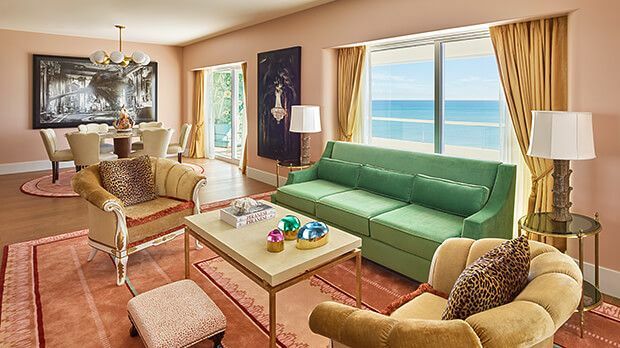 Features 1 King bed, sunset bay view, window bench and marble bathroom with walk-in shower. 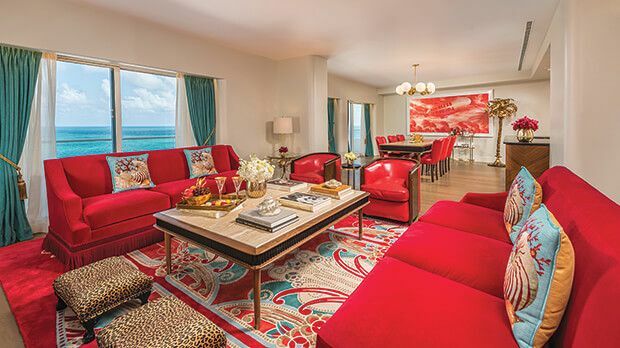 Features 1 King bed, balcony and partial ocean view, marble bathroom and walk-in rain shower. Features 1 King bed, living area, balcony, marble bathroom and walk-in shower. Features 1 King bed, living area and a balcony with ocean views. Spacious suite with 1 King bed and balcony. Features 1 King bed, living area, marble bath with tub and walk-in shower. Features 1 King bed, living area, furnished balcony, marble bath, tub and walk-in shower. Features 2 Queen beds, living area, furnished balcony and marble walk-in shower. Features 1 King bed, balcony with sunset city views, living area, 1.5 bath and walk-in shower. 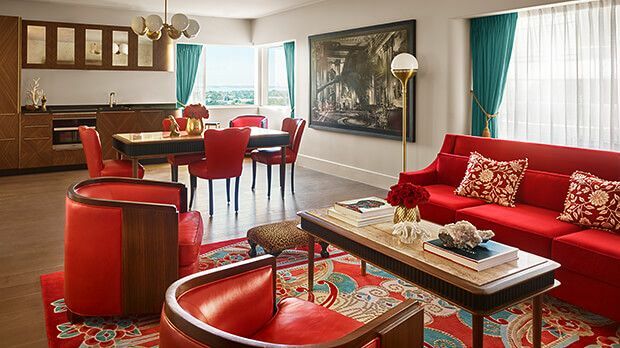 Spacious suite with luxuriously appointed living rooms, comfortable lounge chairs and adjacent dining areas with stylish four-seat dining tables. 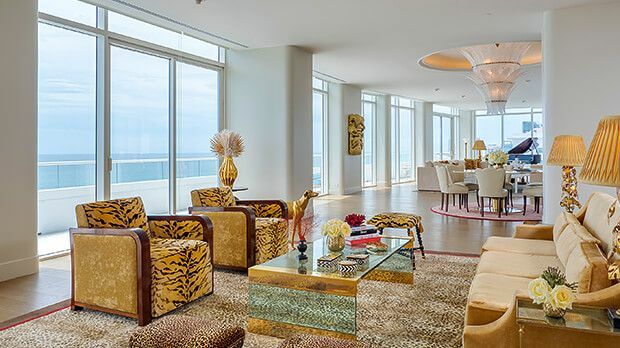 Furnished balconies feature stunning ocean views, king-bedded master bedrooms with private space, Carrara marble bathrooms, walk-in showers and Tierra Santa amenities. Features 1 King bed, 1.5 bath, living area and corner balcony. Features 2 King beds, 2.5 marble bathrooms, living area and kitchen. Features 2 King beds, 2.5 baths, living area and kitchen. Features 2 King beds, 2.5 bathrooms, living area, kitchen and balcony. 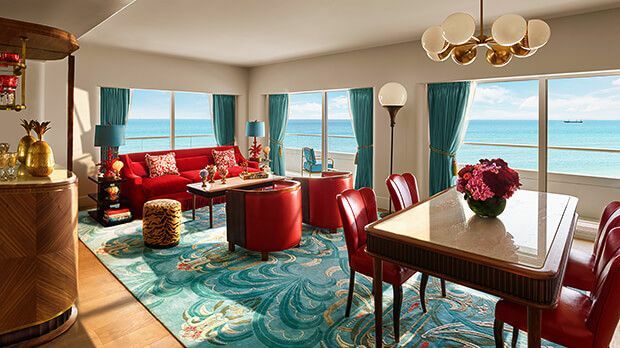 Features 3 King beds, oceanfront view, balcony and living area. Features 4 King beds, 5 baths, living area, kitchen and ocean views. Features 3 King beds, ocean view, living area and kitchen. Features 5 King bedrooms, marble bathrooms, wrap-around balcony with two levels.